This important new volume contains an extensive collection of Russian legal texts translated by the eminent Russian scholar William E. Butler and edited by Professor Butler and Professor Jane E. Henderson. 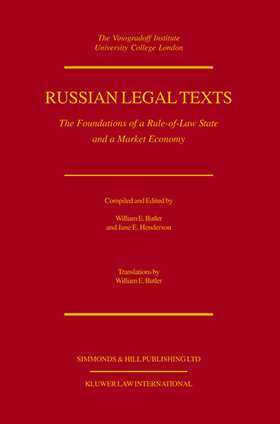 Features unique to Russian Legal Texts: The Foundation of a Rule-of-Law State and a Market Economy include new translation of all material and introductory notes on the legislative history of each enactment, and contextual observations. The broad scope of this work provides the practitioner, legal scholar, government legal adviser, and student with an excellent reference tool for understanding contemporary Russian legal structures. Foundations of the Federation. The Judicial System and Other Tribunals. The Legal Profession. Instruments of a Market Economy. Foreign Relations Law.